The 2017 CRITICS Spring Doctoral School will be held in Lecce, Italy, from April 18th to April 22nd, 2017. The CRITICS Spring Doctoral School aims at strengthening the analytical toolkit of young researchers in dynamical systems. In accordance with the ultimate objective of developing a reliable and accurate theory for critical transitions in complex systems, the CRITICS network offers training in the methodologies of related fields of mathematics. Students from outside the CRITICS network are also warmly welcome to participate! The school will include two intensive courses, one on operator semi-group methods and another in multivariate modeling via copulas. These are augmented by a co-operative project work, building on the content of the courses. In addition to this, we offer talks by established professionals in dynamical systems and their applications, and a unique opportunity to meet interesting people in the pleasant and stimulating environment of southern Italy. 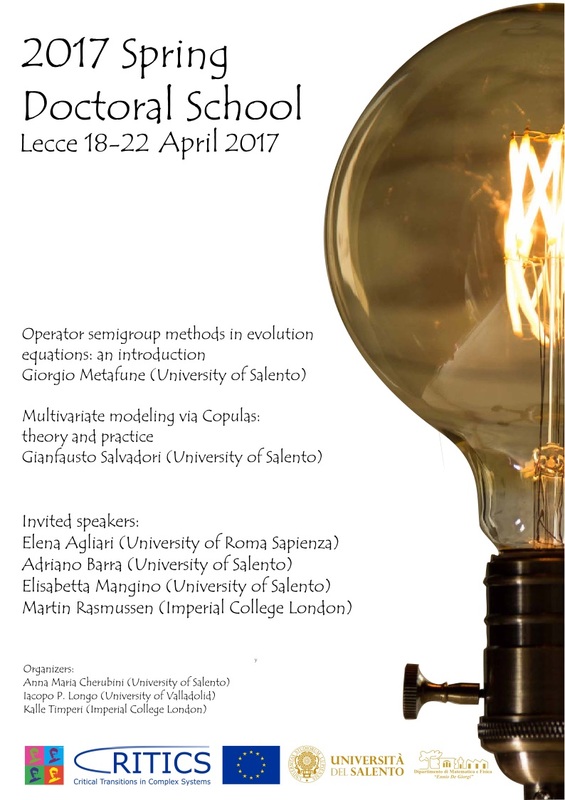 Operator semigroup methods in evolution equations: an introduction. Giorgio Metafune (University of Salento). Multivariate modeling via Copulas: theory and practice. Gianfausto Salvadori (University of Salento). The CRITICS innovative training network, funded by the European Union, brings together PhD students from all around the world in order to provide a multidisciplinary environment and framework for the individual PhD work. To reach this goal, the network offers a number of winter and summer schools and conferences, bringing together experts and students in different research areas, bound together by the common framework of dynamical systems. The network also aims to bridge the gap between science and the society at large, through collaboration with a number of partner organizations.